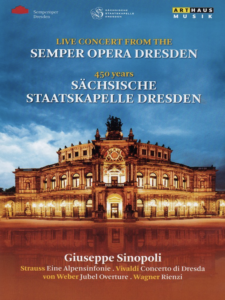 This recording of the grand festival concert celebrating the 450th anniversary of the Sächsische Staatskapelle Dresden at the Semper Opera House in 1998 is enriched by a wealth of historical detail. 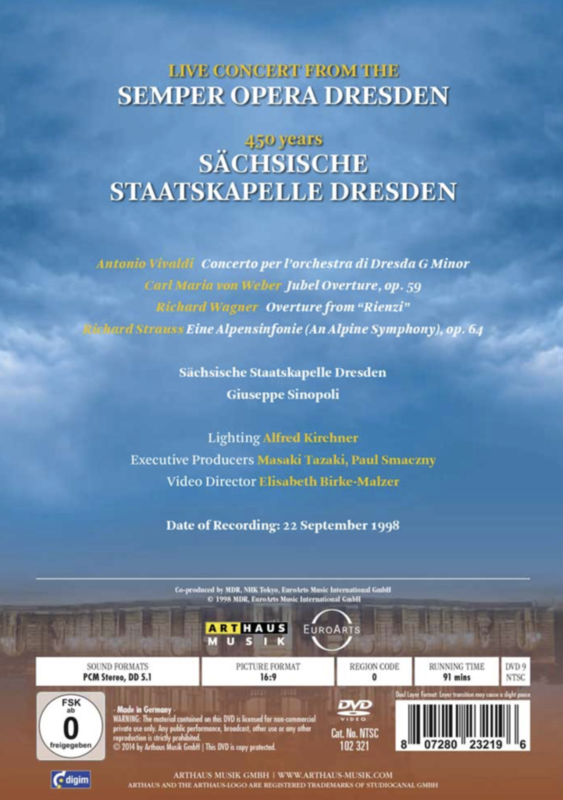 The pieces in the selection – performed under the musical direction of Giuseppe Sinopoli – were all premiered by the Sächsische Staatskapelle Dresden. These are the masterpieces of western music. Heading the lineup are the “Alpensinfonie” by Richard Strauss, the overture from Richard Wagner’s “Rienzi” and Antonio Vivaldi’s “Concerto di Dresda”. The concert was held under the aegis of Germany’s former Federal President, Prof. Dr. Roman Herzog.